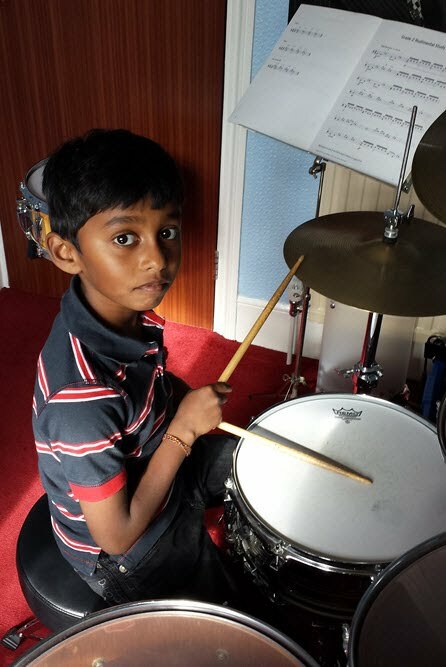 Huge congratulations to Tyler who just achieved a distinction in his Trinity grade 5 Drum Kit exam. The grades really do get a lot harder as you progress through them so he should feel rightly proud. In July and August 2014, I spent 3 weeks in North East India, some 100 KM from Darjeeling in the Himalayan foothills. One day I could hear beating drums from far away, so I headed out the house and just walked towards the sound, some half a kilometre away. The drumming was the Little Angels Academy practicing their marching and drumming along the road. This was preparation for the upcoming Indian Independence day (15th August), where every school presents a march past. So not much studying goes on this time of year! I introduced myself and soon after started teaching there from about 2 weeks. 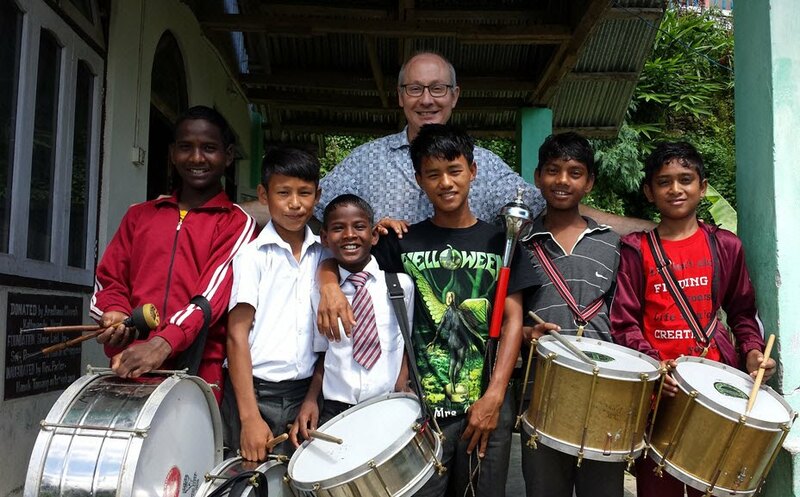 Little Angels Academy is both a school and an orphanage, and has children from a wide area. Mind you 9 in the morning is not my usual idea of a good time for drumming, but I had to avoid the main lesson times. Umesh Munda, Dipchand Thapa, Akash Lohar, Sarad Munda, Rewaj Rai and Sanjay Bhujal. Here is a good view of the Himalaya looking East. Since it is so mountainous, flat, level ground is rare so this was the only spot we could practice. 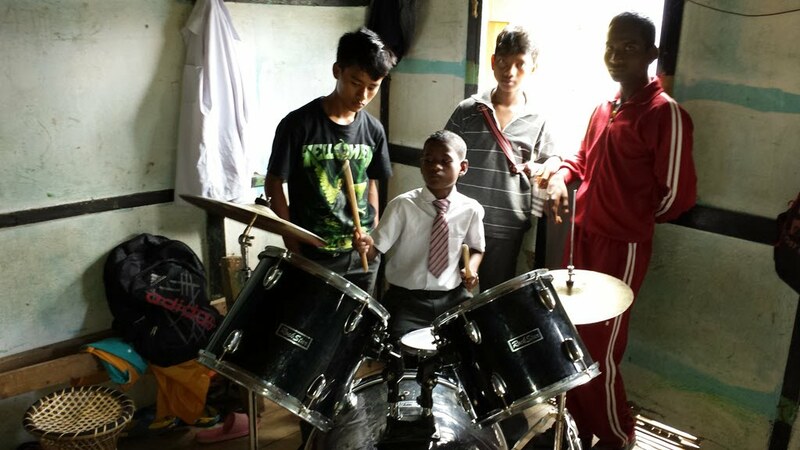 Here is Akash Lohar who is 12 years old and he is a talented drummer and footballer. The academy a drum kit on loan and so I taught a little on this too. Sarad Munda who is also a good drummer, is offering guidance to Akash Lohar. My youngest pupil who is now 7 but was still 6 when he started having lessons with me, has just scored 80% in the Trinity grade 1 exam - a strong Merit pass. Rishie worked very hard in the final few weeks before and this made such a difference. Congratulations Rishie! To be honest at first I thought it was a wind-up, when I got the phone call asking for drum lessons as a surprise Christmas present. Recently I have had a daughter arranging lessons for her father - sweet, and a woman arranging lessons for her partner. Well Friday the 13th is supposed to be unlucky, but this was definitely not the case on Friday the 13th of December 2013. I very much enjoyed drumming with the band and choir of the Woodford Liberal Synagogue. This was for a special Friday night (Shabbat) service, called Woodford Resouled - get it - music for the soul ?! 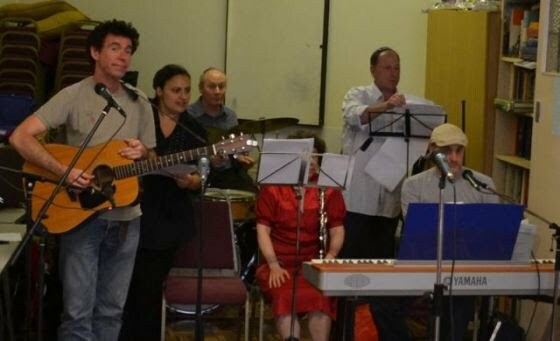 The musicians were tutored by Dean Staker, the singer, guitarist, composer (top left above), who is Musician in Residence at Finchley Progressive Synagogue. 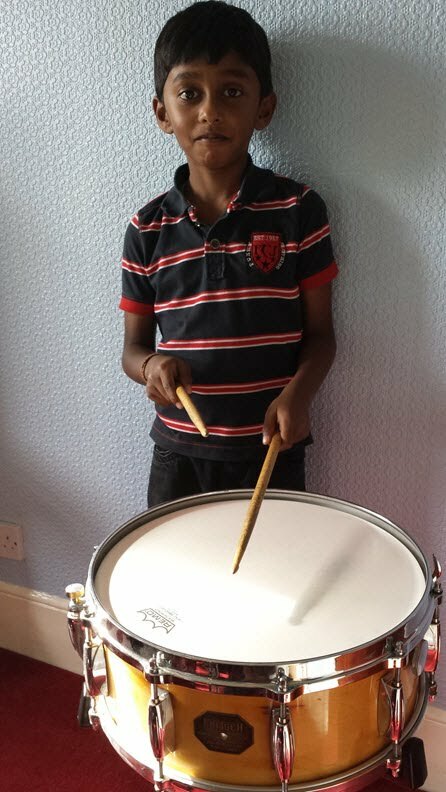 Congratulations to Sunil for achieving a Merit pass in his grade 2 drum exam in July 2013. Extra special as this was his first music exam. Congratulations to Tyler for passing his grade 3 drumming exam in April 2013. Tyler was my first entrant into the Trinity Guildhall drum kit grade 1 exam in December 2011. He achieved a high merit pass that was almost a distinction. Very pleased. I am pleased to say that the Drumming Assembly has been rescheduled for Friday, 11th February. All the drum students will be playing and it will run at 9.15 for the juniors and 9.50 for the infants. Here's looking forward to it! The school has asked us to postpone the Drumming Assembly I am afraid. I will post the new date here as soon as it is confirmed.